65' Bering Pilothouse Trawler NAMASTEis hull #3 and is the best of the Bering Yachts' fleet. Namaste has been loving maintained and cruised by her original owner who used his extensive commercial maritime background in equipping and outfitting this world cruising explorer yacht. Namaste was launched from the Bering yard in China in December 2013. The owner began his world cruising from there going to the Philipines, Malaysia, Indonesia and spent one year in Australia. 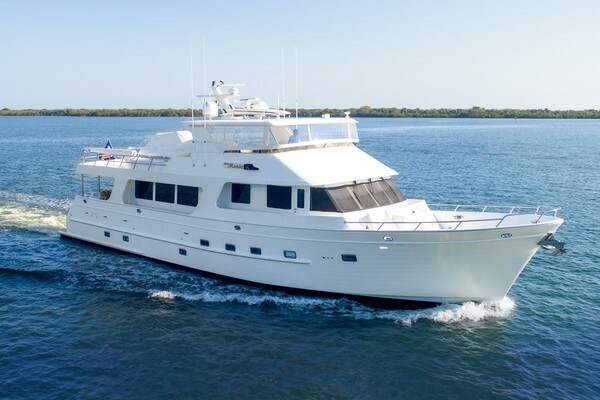 Namaste was then shipped to Florida where she began new journeys island hopping in the Caribbean.M/V Namaste offers twin John Deere engines with a fuel consumption of 8gph, a range of 5,000+ nm, extensive electronics, and exceptional redundancies. Three (3) staterooms, all with ensuite heads, plus crew quarters.You will not find a yacht in this size range that offers more volume, stowage, and amenities. Her interior space and exterior usability offer what you would find on an 80' yacht. Truly, a must see to believe yacht.M/V Namaste is in excellent condition and offers incredible live-aboard space and amenities while enjoying the world in a safe and secure yacht. She is CE certified, Class A, all oceans. United Yacht Sales New Jersey would love to guide you through a personal showing of this 65' Bering Pilothouse 2013. This yacht for sale is located in Port Louis Grenada and priced at $1,995,000. For a showing please contact us by filling out the form on this page and we will get back to you shortly! Entry is from either the weathertight door from the aft deck or the port or starboard weathertight pilothouse doors. Entry from the aft deck leads to a spacious salon. Forward and up a few stairs is a large gourmet galley. Foremost is the pilothouse with extensive electronics and guest seating. From the salon centerline is a companionway that leads to the oversized master stateroom forward and VIP staterooms port and starboard each with ensuite head. Engine room access is through a watertight door. Interior soles are mahogany; interior paneling is pear wood. Access to the flybridge is from the aft deck. Entry to the salon from the aft deck shows an expansive area for comfortable seating, leisurely lounging, dining, and all round yacht entertainment. The full beam U-shaped galley is comparable to the finest gourmet galleys in a residential setting while giving convenient access to both the pilothouse and the guests in the salon. Diamond Seaglaze door that allows for separation of pilothouse from galley for night passages. Retractable electric partition may be used to separate galley from salon. Ergonomically convenient for safe cooking at sea whether for food prep or service. Generous stowage and numerous conveniences. Wood cabinets with flush positive locking handles. Stainless steel drawer bodies with coved inner corner. Self-closing hidden drawer slides. Pantry lockers with slide out storage shelves. Granite counter tops. A 2nd full-size refrigerator is in the companionway before the engine room door. The pilothouse offers excellent visibility. The custom navigation console provides easy reach access to equipment and navigation controls. Comfortable L-shaped settee for guests for pilothouse socializing with fixed teak table. The best of electronics were selected for world passagemaking in all conditions. Bright and expansive, the master stateroom is centered to the bow and offers volume, luxury, and comfort. Generous stowage. Japanese screens provide optional porthole covering. The entire under flooring space is a huge insulated storage area over 3 feet in height. Under bed cabinets. A comfortable and voluminous guest stateroom is to port. Abundant amenities and generous stowage. Large ensuite head. Large ensuite head includes ceramic tile walls and flooring with underfloor heating, electric towel warmer, vanity with corian countertop, and Sealand 8700 series marine toilet. A comfortable guest stateroom is to starboard. Abundant amenities and generous stowage in lockers and cabinets. Ensuite head. Large guest head also serves as a day head. Ceramic tile walls and flooring with underfloor heating, electric towel warmer, vanity with granite countertop, and Sealand 8700 series marine toilet. The engine room is insulated with 4" composite insulation; ceilings and walls have aluminum perforated panels. (2) Aquamet 22 shafts 23/4"
The electrical panel and main battery bank are outside of the engine room to allow for a cooler environment. Composite fireproof wall and ceiling paneling. The electrical system was built to ABYC electrical standards and in compliance with CE certification. Upgraded long-range universal package. The AC power is 120/240v 60Hz; main power is 24v DC; 12v DC for electronics. All wires are marked, color-coded, with wire runs inside a PVC tube or PVC wire loom, with a jacket for each wire. All lights 24v powered. LED for ceiling, rope, and courtesy lights. LED waterproof lights for exterior. The expansive flybridge offers dramatic space for entertaining, dining, or fresh air cruising. L-shaped seating and dining table to port with settee and dining table to starboard. The cushioned settee includes a refrigerated storage compartment. Kitchenette. Teak decks. Steel arch integrated with fiberglass mast. Full walkaround teak-covered sidedecks. Teak on foredeck. Two settees with cushions; built-in watertight hatches to master. The expansive aft deck provides yet another area for entertaining or alfresco dining. Steps port and starboard from the aft deck provide convenient access to the water. The crew quarters has seating, table, Pullman bunk, and a kitchenette. Hull and superstructure are made of marine steel A-36. Bottom plates and integrated tanks sides - 8mm; hull sides - 6mm; superstructure - 5mm. Four watertight steel bulkheads. Flybridge and hard top are 4 mm steel; mast is made of fiberglass.All bulkheads, ceiling, hull sides have acoustic and thermal insulation. All insulation materials are fire resistant. Engine exhaust pipes are wrapped and finished with carbon fiber covers. Composite sound insultion between engine room and living quarters.The hull is painted with Alexseal. All interior of the boat primed and painted with Jotun paint. Hull below the water line painted with three layers of antifouling paint Interlux. Yacht quality faring above the water line. This yacht was featured in numerous publications in Alexseal's brochures.15-year hull structural warranty.